This is the first in a series of posts reporting on the Wildlife Conservation UAV Challenge fact-finding mission to South Africa. Can the makers, students, hobbyists, and entrepreneurs of the world build a drone that could aid the fight against rhino poaching in South Africa? Can they do it for under $3,000? Like any great challenge, extreme constraints often lead to opportunities for innovation. That’s exactly what the Wildlife Conservation UAV Challenge hopes to achieve. Fifty seven fearless teams from 14 countries have already signed up to compete and more are expected to follow (Registration is still open. Design concepts are due by Jan. 31, 2014). If the trend continues at its current pace, more than 1,000 rhinos could be killed in 2014, putting the species on the brink of a population decline that the ministry has said could lead to the end of wild rhinos in about a decade. Complicating matters is the sheer vastness of Kruger National Park, where most of the killings are taking place. UAVs could help rangers monitor a much larger area, but many available UAV solutions are either too expensive or not optimized for the mission. We believe the use of open source software combined with highly configurable open source hardware is the solution to Wildlife Conservation UAVs, cutting costs and saving Rhinos. We’ve been granted special access to the park and its officials as part of our visit. One of our goals is to be the eyes and ears for teams. We’ll be surveying the terrain and interviewing rangers and security professionals to elicit their specific requirements so teams can incorporate them in their designs. We also expect to see some wildlife! Programming Note: DIYDRONES Christiaan van Vollenstee will interview the wcUAVc leadership team via Vodcast from Kruger National Park on Nov. 20 at 6pm South African Time. To join the show please add [email protected] to your google circle. We’ll be viewing numerous demo flights of various UAV designs both in Kruger Park and at other locations around South Africa. I’ll be visiting House4Hack, a hackerspace in Pretoria. Members have formed a team to compete in the challenge. I’ll tour the space, talk to members about the competition’s design challenges and check out some of the projects they are working on. 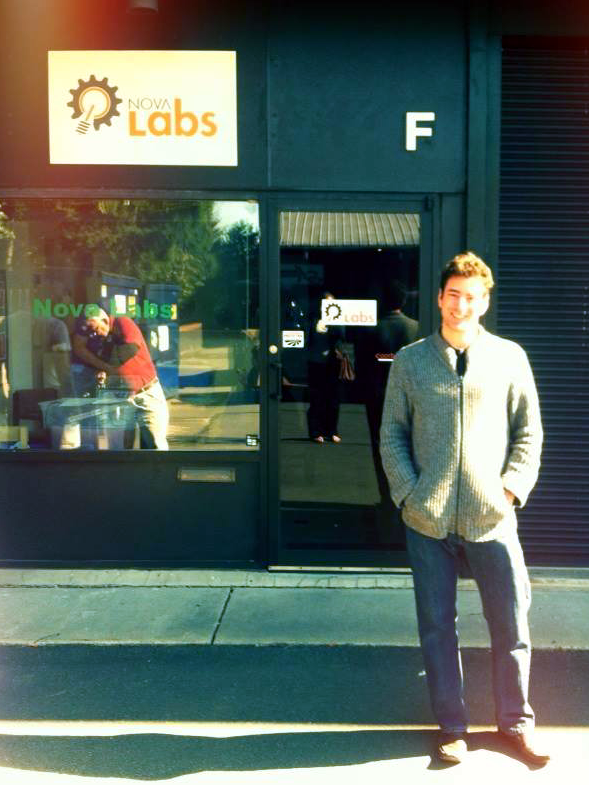 Me, outside Nova Labs. (Members can be seen doing some woodworking in the reflection). You may be wondering how I came to be involved with the UAV challenge. I credit the primary organizers who approached me due to my work at Nova Labs, a nonprofit makerspace in Northern Virginia. Organizers saw the potential role that the maker movement and open source hardware has in crowdsourcing low-cost, innovative solutions to the world’s biggest problems. I’m excited to have this opportunity and will be enthusiastically promoting the challenge and the efforts of makers around the world. Since our founding 2 years ago, we have quadrupled our membership, doubled in size and are looking to expand to 10,000 sq ft. We support a community of over 1,000 makers and offer an array of equipment and programming, including STEM programming for kids. To see some of the projects we’ve been working on, visit our website and our Flickr Stream.